Our fantastic crews will be out driving our trains for your enjoyment from 10 am until 2.30pm on Sunday 28 April. 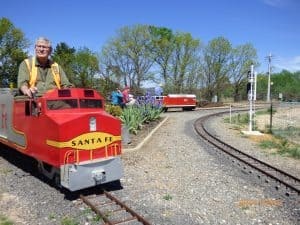 Driver Kel loves taking out our 81 class loco with a full compliment of passengers, Driver David and Driver Mike will have do double lap specials with the Jumbuck through the tunnel and Driver Peter or Driver Ward are experts on the Yerrabi Line to the top of the grade and back. Come and check us out! We have free parking, loads of food and drinks from the ‘Dining Car’, and special guests from the Canberra & District Historical Engine Club showing off their old stationary farm equipment. Rides are only $3.00 or as many as you like with an all day pass for only $15.00. We cater for birthday parties: to book a BBQ in our enclosed area call 1300 731 954. Hope you can visit!